Conestoga won the district 1 AAAA championship 2-0. Chris Donovan scored a brace. High school soccer is complicated enough in District 1 – only some 24 teams enter the bracket through a points system based on the records of the teams and their opponents. But there was never any question about Conestoga, who finished the regular season undefeated. They went into the tournament seeded number one and proved that seeding correct. The state tournament boasts four hard knockout games in a row. Maybe not hard for ‘Stoga, though, which finished 25-0-1 on the year. They won state last year too. The Pioneers faced Hempstead in the state final. 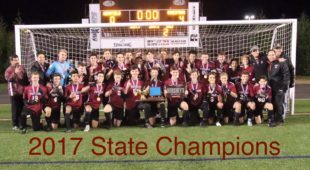 On high school soccer’s biggest stage Chris Donovan once again played hero and scored four goals to give Conestoga the state title. 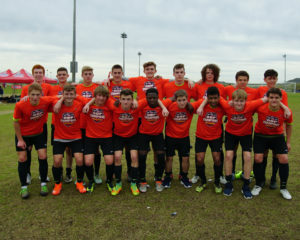 A local team that represented the region with aplomb, the ODP U17 program not only won the regional tournament, but used that success as a launch pad to win the national championship. In the opening game of the national tournament (a four team single elimination event only open to regional winners) the team conceded a pair of penalties in the first half against Georgia. They went into half time down 0-1, despite keeper Jacob Varrato’s heroics. In the second half Eastern PA came back and scored two to win. They advanced to the final where coach Gary Stephenson was happy to see the team’s finishing coalesce. In the final, the team put an unanswered seven past Oregon, including a hat trick from Nick Brison. Read more about this achievement from Easter PA Youth Soccer’s Dillon Friday. The team did not rest on its laurels in 2017, but added to them. They reclaimed the Region I title in June, beating New York 5-2. Among other positional changes from the national tournament, the team moved a centerback to the attacking mid role. Read more about that tournament here. Author: Josh Trott Josh Trott grew up in Olney playing for Olney AA and went to Central HS, where he warmed the bench. After college, he taught, coached and played in Uganda at Christ School Bundibugyo. He returned to Philadelphia, where he has taught and coached for ten years. Currently he coaches Central's varsity boys. In 2014 he published Nobody Says Hi Anymore, in which a lone teenager uses a Philadelphian toughness and honesty to survive the zombie apocalypse. Your team is very happy to get this win. So I want to congratulate you with this. Have the best of everything! A great group of players which I was fortunate enough to work with the past two years. I wish them all the best and look forward to seeing them continue playing at a high level.